I can't find the run.bat file i'm having real problems D: and it won't compile on the website. Your youtube video is gone can you post another link? i have about 10 times how can i do the run.bat file? can someone help with this bit? And before you ask, I won't help with it because the websites gives you 100% of what you need. PATH is where your jdk/bin location is. Usually Program Files, in the Java folder. i'm trying to use the guide :/ its confusing as hell im dumb and do no computing :3 these websites might be easy for you to understand but not for me! my langauge is bad english! also my computer requires a password that i know not! and i can't get any further!!! Wait you don't know how to download java nor jdk? 4) Download jdk from java website. 5) Choose what you got from windows etc . . I did what you showed in the video (I found it very helpful). Now when launching Parabot with -loadlocal, I get an error saying I don't have script writer priviledges. Does that mean that I can't write scripts for myself to use (locally)? I'm not sure I have the skills to become a script writer (1st year CS student, no prior Java experience, ~5 years of learning programming on my own though, including OOP), but I would like to learn writing scripts for Parabot and fool around a bit. Soulsplit does not allow local scripts, only scripts writers are allowed to. Some of the minified links don't even work, so it's impossible right off the bat. Great guide, taught me a lot! i did everything like the video, but the script dont show up in the client. anyone can help me? 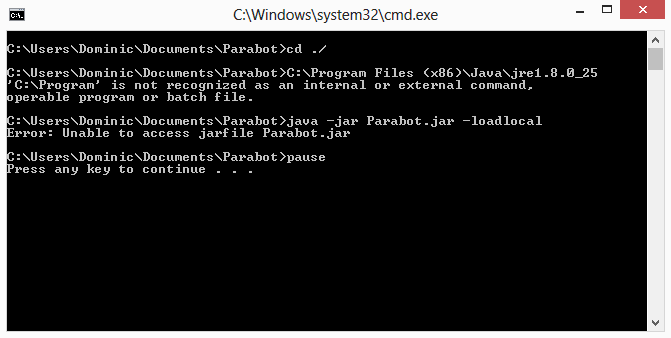 If you have compiled your own script and uploaded it to your parabot folder, please open parabot with -loadlocal to be able to see the script, if it still does not show up, then it is broken.